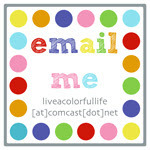 Live a Colorful Life: Good Neighbors Pincushion Party--and a Giveaway! 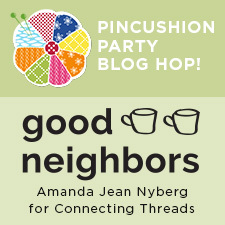 Welcome to my stop on the Pincushion Party to celebrate Amanda Jean's beautiful new line of fabric for Connecting Threads, Good Neighbors. Amanda Jean, well known as Crazy Mom Quilts, is a dear friend and I am fortunate enough to spend a few days with her every July at a quilting retreat in Minnesota, including a night at her home, always under one of her fabulous quilts! I have already had a lot of fun playing with her fabric (here --scroll all the way down to the bottom of the post--and here). And it is just as bright and cheerful as Amanda Jean herself. You can see that there is a wonderful range of cheery prints, each with a touch of white. After contemplating several different ideas, I finally decided to do a mini dresden block (pattern here) with some hand stitching. If you know Amanda Jean, you know she loves all things small and scrappy, so this seemed like the perfect way to use lots of the different prints. I used the X's print as the base. I love this print--the only way to make it better would be to have it in all the colors! Connecting Threads has generously offered to give one of you a charm pack of this fun fabric line. So leave a comment and tell me if you are a scrap quilter and what is the smallest scrap you save. Good Neighbors is available as yardage and precuts, as well as 108" backing from one of the prints. Here is a list of all the participants, so if you love pincushions, you will get lots of good ideas. Which is great since the holidays are just around the corner and pincushions make great gifts for your quilty friends. I love the Dresden pincushion you made. I don't know how I missed it before but I happy to know that one of the fabrics is available in 108" widths. Super info! Gorgeous Mini Dresden Plate pincushion! 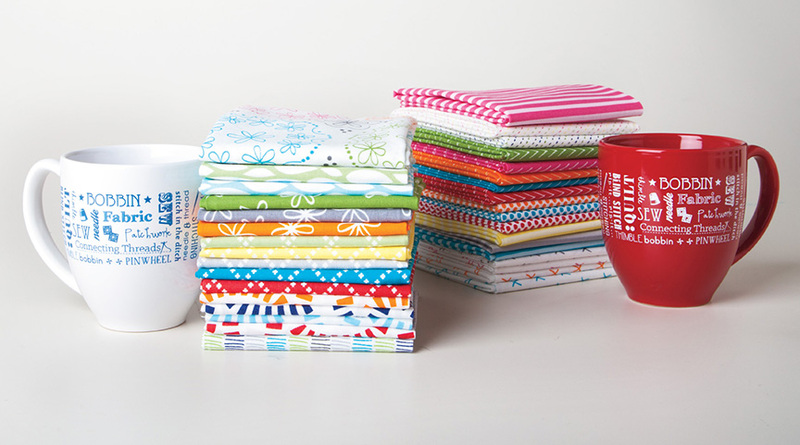 Yes, I am a scrap quilter, and I basically save every little piece of scraps! I save scraps but try to limit them to no less than 1 inch square. Love your pincushion... Especially with this fabric collection! Beautiful colours and prints. I quilt with scraps and try not to keep anything smaller than 2"... But I do have a special container with my itty bitty favourites. Love this pin cushion...I try to save scraps that are no smaller than 2 inches. I never seem to find the right thing for the smaller pieces and I need the room! Love the mini Dresden! I'm a scrap quilter for sure. My smallest scraps are 1 1/2" squares for a postage stamp quilt. I became a scrap quilter this year after seeing a scrappy offset rainbow on the blog of Cynthia Brunz. Last month I cleaned a big plastic Sam's pretzel jar, put a pretty label on it, set it on my cutting table, and it is 1/4 full of scraps. Optimistically saving no less than 1 inch squares and 3/4 inch strips. Halfway through my coffee, saw the title of your post, but still thought your pincushion was a big pillow. I'm not very good at using teeny tiny scraps! Love your mini mini dresden though! and I do scrap quilt and I save all the way down to 1" by less because I am crazy! A 2" square is the smallest I save. I'm much better at organizing scraps than I am at using them. I really love this pin cushion, so cheerful! I keep too many scraps, it depends on my mood at the time of generating them and how precious the fabric is, but scraps under 1 1/2" would usually end up in the bin. So beautiful.I 1 1/2 is the smallest I save. Probably 2 1/2 inch squares are my smallest that I save on purpose, but I do have a scrap basket with all kinds of pieces that I just throw in! You never know when you might need a little something, right?! I love your little Dresden pincushion, and thanks for the chance to win some of Amanda Jean's sweet fabric! I use scraps now and again and save things that are around 2 1/2 by 3 or larger. It kind of depends on the print. I tend to save smaller scraps of solids than of prints. I am a scrap quilter and if i really love a fabric I will save every little bit to add to something. I'm a scrap quilter and crafter. If I really love a particular fabric, I will keep strips as small as a 1/4 inch and use them as borders on cards & tags. I haven't been able to make anything too scrappy yet as I'm a Mama of six, ages newborn to 10. So I haven't had a lot of time to gather many scraps. But I have a box where I keep 1 1/2 inch square pieces leftover from my sewing projects, and someday I will use those to make an amazing scrap quilt. Someday! 😄 I love you pincushion!! And I love this fabric!!! I keep scraps that are at least 1-1/2" strips or would make at least a 2" block. I haven't done much with them yet except for 9 crazy quilt blocks. Generally, I save things bigger than 2". Unless they are a fave! Cute, cute pin cushion! Love the mini dresdens! I use to save everything, but learned that it became a hot mess far too fast! I usually take smaller scraps and cut them into managable squares. They vary in size, but it is so much easier to manage! I try to used every inches of fabric and the smallest are good to be used as filling. Your pincushion is really bright! What a sweet little Dresden! No scrap is too small! I keep them all. I seem to always find a use for them. Thanks for the chance to win. Another fun pincushion. I have a very hard time getting rid of scraps and I am always looking for ways to use them. Thanks for sharing your dresden pincushion. I love all the scraps and you think can this bunch of randomness really turn into a beautiful project and yes they can! I don't think of myself as a scrappy quilter but I can't throw fabric away. I will keep 2.5" squares, stripe at least 1" wide and selvedges. Good Neighbors is such a great fabric collection - Kudos to Amanda Jean! I'm actually not much of a scrap quilter. I keep anything charm-square size or leftover binding or larger, but I collect my small scraps until I have a quart-size zipper baggie full, then donate them to the free table at guild. I love to create with scraps! I keep down to about 2 1/2" squares and strings down to about an inch. Your pincushion is adorable! Love the mini Dresden pincushion! Great choice for a great fabric collection. I save all scraps that I can get 1/4" seam allowance around and still see at least part of the fabric as I make 6" crazy patch blocks. What a cute dresden pin cushion! I save all sizes of scraps and enjoy the challenge of using them in different projects. Yes, I save everything, but slivers. You just never know. I love scraps.....I can't throw any fabric scraps away. I just know I can use them for sonething! I love your Dresden pincushion, especially your hand quilting. I tend to save anything over an 1 1/2 inch. I am definitely a scrappy person. It gives me a reason to save everything. I am a scrap quilter and the smallest I save is around 2" square. Thanks! I am a scrap quilter and save just about everything. Sometimes it gets ridiculous! But then I'll use a bunch of tiny scraps for a super cute pot holder or something and remember why I save them. Love your pincushion, tiny dresdens are adorable! I probably save everything over 1 inch. Love this fabric collection! Lovely pin cushion :) I'm always using up scraps, I wish I could get rid of some tiny pieces sometimes but I can't resist keeping them! I love scrap quilts. The smallest strip I save is one inch. Smalles square is two inches. Is there anything sweeter than a little Dresden plate!!?? Your pincushion is lovely! I keep way too many scraps! I have a tub of 2"+ in every colou imaginable! I like to make scrap quilts and art quilts, so I save even tiny pieces or gluing into collages. Your colorful pincushion is delightful! I love your pincushion. I save all scraps but then I am a hoarder of fabric! I save all sizes. I have a box I put scraps in and I use it for stuffing in handmade animals. I put my small scraps in a pillow for the cat. Of course she didn't use it, she prefers the much larger dog bed. The smallest squares I save are 1.5". Love your pin cushion. I love your pincushion. Anything 2"x2" or bigger or a triangle it goes into the scrap bag. When the bag gets full I sort them into either light and dark or by color depending on my idea at the time. Often time I realize that I don't have enough to make what I wanted. They make great crazy quilts, and a few scraps quickly become a large piece of fabric. I keep every little scrap. i cut the smallest pieces into 1" squares. any odd size scraps that are too small for that, i bring to school for my preschoolers to use in collages. i"m a scrapaholic. My goal is each year to make at least one scrappy quilt. So far so good for 4 years! I sure am a scrapper! I even keep my snipped off threads, selvages, and thin cuts of scraps. I like to add them all on a piece of interfacing and sew on them, meandering style, to make my own fabric pieces. It's very unique and creative. Love the mini-Dresden! Love the mini-Dresden pincushion! Cute!! I am a scrapper, and save pretty much everything! Such a gorgeous fabric collection. I only save small (less than 2.5") if the fabric is especially precious. I have way too many scraps. I am a scrappy quilter and the smallest scraps I save are at least 1/2 inch. Sure would love to win. I love your pin cushion. I'm still new to quilting, but I've always sewn clothes. And it kills me to throw away those beautiful little scrapes, so I've started sewing them together to make quilts. My stash of scraps has built to a level that I am just about ready to tackle a scrap quilt. I save pieces from about 1.5" wide, but I also have a basket full of strings that are even narrower. I do save all my scraps although the intended use is not yet known to me. : ) I don't save anything smaller than an inch these days simply because I have so much saved already. I love your sweet pincushion and I am so, so jealous of the wonderful retreats your group has. They look like a wonderful time! I save 2.5" scraps but if I find some smaller pieces that work for a small (1") block then I'll save that too! I love the dresdans. So cute and tiny. I am a scrap quilter and I keep 1.5 inch squares as my smallest scraps, but I do have the bags of smaller ones I use to stuff dog and cat beds. I'm not a scrap quilter but I do keep scraps. Maybe 2" squares are my smallest? I keep thinking I'll do something with them. Every once in a while, I give them away. I'm still a beginner quilter so I dont have many scraps! yet! I also am a beginning quilter. So not a lot of little scraps yet. but I love scrap quilts! I just recently began saving smaller scraps- 1 1/2" to 2". Don't have too much in the bin yet. The bulk of my stash is about 4+". Thanks for the chance to win. I am totally a scrap quilter! I made Amanda Jean's Scrap Vortex quilt and it was such a fun quilt to sew. I cut and piece 1-1/2" X 1-1/2" squares that I sew together as leaders and enders to make 4" 16-patch blocks. I have more than 100 of them now and still don't know how I'm going to sew them together! Love, love, love Good Neighbors! Thanks for the chance to win! I love the dresden block on the tiny "x" background - love love love it - it is perfect - makes me smile! When I first started quilting I wanted the scrappy look, but I didn't have any scraps, so I bought men's shirts at Goodwill to cut up. Now I have plenty of scraps and I keep pieces that I think I can sew into a scrap vortex block. Smaller than 2 x1 would disappear into the seam allowances! Yes, I use scraps. If I can cut a 2" square or get a long 3/4" strip to crochet, it's a keeper! I do scrap quilts, but I don't save anything smaller than about 2 inches. Love the stitching in this pin cushion. I save everything that looks useable. I am just starting, so I don't have much, but I bet I will have to set a limit here pretty soon. I love scraps and save just about everything! I need to start making some scrap fabric!! I save EVERYTHING. And I have no idea what I'm going to do with it! I have become a scrap quilter. The smallest size I use is 2.5" square but the smallest I SAVE is 1x2. No idea what to do with those but they seem to be big enough that I can't chuck them. I'm a scrap quilter and right now I'm saving 2 1/2" squares, nothing smaller. 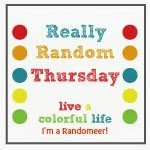 Enjoying the pincushion party blog hop. I am definitely scrappy! About an inch is as small as I will save but sometimes that is too little and I "donate" to my dear friend who is an elementary school art teacher. Your pin cushion is adorable! I have never quilted with scraps, because I'm a new quilter, but I save my scraps. I save all of my scraps in a ice cream bucket and if they are too small for anything I use them to stuff pincushions too. I save 2 1/2" squares as they have become versatile in quilt patterns. Too too cute Cindy. You and I think alike about needing the x print on more colors. Love that one. I usually don't keep anything less than 2 inches square. Thanks for the giveaway!! I am definitely a scrap quilter and keep all pieces - 1cm x 1cm even, so I can do small paper piecing without wasting much!!! Love your pincushion!. I am definitely a scrapper. I save every thing I possibly can use. My strips are as small as 1 inch wide and my squares are 1 1/2 inches Thank you for the giveaway. I scrap quilt occasionally and am now saving mostly strips, smallest I have saved, 2.5".... Love your pincushion, this fabric is truly inspirational! I am a saver. Since I've only made 2 quilts, I don't have much in the way of scraps but I have them all saved. I guess the smallest would be about 2"x2". But I do have even smaller pieces saved for fabric postcards. Postcards are like mini quilts....I've made lots of those! Thanks! I don't save smaller than 1 inch unless it's selvedge, or a strip long enough to be a ribbon on a present. Well... Or unless it's the hst trimmings from a quilt I love - so much so I could imagine making a mini with the trimmings. Love your pincushion! I'm definitely a scrapper! I do save scraps, 2 in or bigger. I like the leaders and enders approach and make 100 squares blocks. I love using scraps! I save pieces as small as just over 2 inches square, and also save strips of any width, as long as it is wide enough to sew on. Oh gosh! Super duper tiny pieces . . . I even save the trimmings from paper piecing!! I save pieces about 3x3 for using with appliques. I like to stop at 2-1/2 inch squares; anything smaller gets chopped into confetti size pieces which I use when making thread bowls. Hello Cindy, What a tribute to Amanda Jean w/the scrappy Dresden pinnie. I've never completed a Dresden block' just an adoring on looker. I save scraps as small as the little dog ear corners you clip, just in case I need a splash of color in a corner. Thanks for sharing. I love using scraps! I have clear large vases that I throw scraps in. It decorates my sewing room and is good storage. My kids get to use anything from the vases when they feel like sewing. Thanks for the chance to win! I love how you were able to get so many of the fabrics in your pincushion. The minimum size I save is 1" in width or length. I do love using my scraps. Once I made a quilt in many shades of green with a little brown thrown in. All the slivers left over ended up in a jar for awhile because they were too pretty to toss. Your pincushion is so pretty! I save small scraps. I use them when I paper piece. I use a lot of scraps when I paper piece and I save as small as 2". I'm a real hoarder so I'll save just about everything - 'I'm certain there's got to be a use for this even if it a little on the small side' - that's what I say all the time! Your pin cushion is fab. I love scraps. I have a hard time tossing them. If I love the fabric I will save 1.5 x2 inches. Whatever I think I can sew into a Vortex quilt. I have a hard time throwing anything out...1/2" is maybe the smallest. I have in my mind that they would be cute tied to a small Christmas tree!